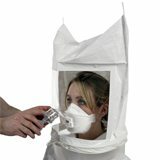 Face Fit Testing is suitable for anyone who wears respiratory protective equipment (RPE) on either a frequent or infrequent basis in the workplace. Face Fit Testing can be done at our training centres or at your own premises. When Should Fit Testing be Carried Out? A Fit Test can be carried out in the initial stages of selecting RPE, where an untested face piece is already in use or when the wearer has any significant facial changes (i.e. weight gain or loss, facial hair growth, etc). Fit testing does not need to be done annually but it is recommended that face piece wearers receive annual refresher training covering the selection, use & maintenance of their mask. When face pieces are issued on an individual basis, it is recommended that they receive an individual assessment on their own face piece. Please note that in order for the face fit tests to work, the trainee MUST NOT eat, drink or smoke for at least 30 minutes before the test is performed. They must also be clean-shaven as stubble will prevent a good seal and the face fit test will fail. Trainee's must bring their own half mask. Who is Face Fit Testing for? Anyone working with Respiratory Protective Equipment.